Smartpens creates digital copies of your hand-written notes or drawings. They are a less distracting way of taking notes on an iPad since there’s nothing to get in the way between you and the paper – no popup prompts to rate the app, no push notifications to distract you, nor any rigid structure of how you structure your notes. The software in the pen works in the background to copy your notes into the pen itself. Then you will always have a copy even though you lose (or discard) the original paper notes. It is somewhat more practical than scanning your paper notes afterwards or taking photos of them. Here you’ll learn a comparison of the two best digital pens available today. They are Livescribe 3 Smartpen and Equil Smartpen 2. I’ve been using these two for different purposes, and each have their own tradeoffs. These are best as according to Digital Pen Reviews. Livescribe 3 is the best in the special paper category whereas Equil is the top for the regular paper category – more on that later on. The main difference between the two digital pens is how they capture your notes. Each method influence the pens design and how you use it. Livescribe 3 Smartpen uses a camera inside the pen pointing downards towards the paper. Hence the pen needs special paper to work – that has markings to help the pen know where the tip is pointing at relative to the paper. You can buy these special papers (there are a few sizes and models) or you can print it yourself if you have a high-resolution color printer. Equil Smartpen 2 detects the pens position by using a combination of infrared light and ultrasound. It can be used with just about any piece of paper. The pen comes with a special clip that you need to place on top of the paper that you need to write on. This clip is really where most of the smarts are – it monitors the position of the pen, records your writing inside its built-in storage, and communicates with your mobile phone or laptop to upload your writing. Whats common with both pens is that they are both ballpoint pens that takes in standard D1 refills. Equil is generous to include four starter refills within the package, so you dont need to buy a refill for quite some time. However Livescribe doesnt include any extra apart from the one that is installed in the pen itself. Although standard, I found that these pen refills are hard to find in bookstores both in Singapore and Jakarta. If you order your pen via Amazon, remember to add in some of these pen refills as well to save shipping costs. Both of them also needs to be paired with either an iOS or Android device via Bluetooth – the device that will contain long-term archive for your notes. But dont worry, you dont need to keep the pens connected since both have enough on-board storage to keep more than a full days worth of writing – even if you write all day long. You’ll only need to connect the pen when you want to archive your writing for digital viewing. Their design differ greatly partly because of their different digitization methods. Each also seems to target different market segments, simply to their external appearance. Although their retail prices doesn’t differ by much. In a nutshell, the device to be a better fit for the artist or designer working alone on a sketch. It’s a two-piece device, the pen and a clip that you need to put on top of the piece of paper. Fortunately they also provide a carrying case that doubles as the charger for both parts and carries an extra pen refill too. At a glance it looks like a cool gizmo – triangular white pen with equally triangular carrying case with built-in flip cover. However its cool-ness is also an attention magnet. You’ll definitely get questions from colleagues, “What is it?” “What does it do?” “Can I try it?” The design makes it difficult to use the pen on a group setting without attracting attention. Good luck trying to use it nearby a toddler – the constantly pulsating light from the clip would lure the kid to you. What’s worse is that this light is also the “new page” button which signals the pen that you’re done with the current page; during my use, my 2.5 year old (at the time) son keeps on pressing this button, interrupting my work mid-way. What’s great with Equil’s solution it can use normal paper, minimizing its operational cost. This makes it even better suited for use by the freelance artist or designer. But even for drawings it is no match for a graphics tablet (e.g. Wacom). Its maximum resolution is 1536×2048 pixels or about 175dpi when you use A4-size paper – even handheld scanners can easily exceed that. Then again the pen would be a much cheaper alternative to an iPad Pro for sketching in the field. What’s not so great is that sometimes the pen splits pages on its own. You might think that you’re drawing on one page. But if the pen gets idle for some time or temporarily loses connection with its clip, it automatically assumes that you’re writing on a new page. You’ll only see this when you import your notes – sometimes you find some pages that are half-empty with the other half located on the subsequent page. Their software provides a way to merge these broken pages, but it’s a tedious manual process. There are some other reviews mentioning that the pen emits a buzzing sound similar to a tattoo machine. The buzz is very faint and can be ignored most of the time. It also goes away after about half a minute. In the manual Equil says that this buzz is intentional and indicates that the pen is working correctly. I find it a plausible explanation since the pen uses ultrasound to work; maybe the buzz serves to test the ultrasound speaker – run at a sonic level for the first few seconds of activation for self-diagnosis. Put simply, Livescribe is better suited for the office worker who needs to attend many meetings and jot a lot of notes. The pen has muted conservative design and looks more like a traditional executive pen. Except for the green/blue light on top and legal notices embossed near the clip. I do wish that Livescribe can go all the way and make these components more discreet so that the pen can truly disguise itself. Still it needs specially printed paper to work that also hints that it is a digital pen. But this leak may be further concealed if you buy their Moleskine notebooks – those could get pretty expensive, but may worth the money if you work in legal and the like where appearance is important. The other option is that you can print your own special paper using a high-resolution color printer (600 dpi minimum). Since such printers are often available in many offices for employees to use – at least in the better companies – Livescribe’s offering would be fitting for corporate dwellers. Both of these pens requires their own software to function. There is no third-party software (as I am aware of at this time of writing) and therefore their bundled software is an integral part of the user experience. Note that as an Apple user, I only use their software that works with my chosen platforms — macOS and iOS. Each pen provides bundled software for other platforms as well but I can’t vouch for those. Just remember to check each product’s website to see whether they have software for your operating system. Again, Equil’s software solution seems to be geared towards the digital artist. They have a feature showing your sketch being digitized in real time as you draw it. More so the app offers drawing tools such as brushes, crayons, and multiple colors. So even though you are sketching black-and-white on paper, you could be really painting full-color graphic in the digital version — at the same time. They provide two apps on iOS, Note and Sketch. The latter has drawing and painting capabilities whereas the former is primarily for taking notes. What’s interesting is that they have a macOS app that combines most of the two iOS apps’ features into one. Note that the mac app was a bit buggy with iCloud syncing. There were times when the app blanks out a few pages on my notes that were synced via iCloud. They said they have fixed this but I’ve switched to Dropbox syncing before the fix came out. Syncing via Dropbox feels slower since I need to start the process manually and need to wait for its completion. But at least I haven’t experienced any missing pages since I change the syncing method. Time handling is rather poor. You get a time stamp with each page on when it was first written on. However due to the page-splitting firmware bug (see the section above on the hardware), when you merge two split pages the combined page’s timestamp is when you did the merge. As a result, the page order gets messed up. This may not be such a big issue if you are doing single-page sketches. But when you have multi-page prose this becomes a real pain. You need to do it manually by marking a region of text in your notes. It overwrites the original handwriting and replace it with an image of the recognized text. It’s nowhere near 100% accurate. So not only you lose data by trying to get your handwriting converted, the resulting text is converted back into image data that doesn’t help for search ability of your notes archives. Not to mention that it barely reads the writing half-right. Again, you probably won’t need this feature if you only do sketches. Livescribe’s app supports the note-taking use case quite well. You get digital copies of your notes as well as textual transcriptions of it – automatically. It does handwriting recognition in the background and the resulting text is stored as an extra layer in addition to the handwriting image. The recognition accuracy is fair, but that is not a big problem since it retains your original handwriting as well. What’s cool is that you can perform a full-text search over all your notes. Just enter a keyword in the app’s search box and most of the time, the app should be able to find it. You’ll get a list of snippets of your original handwriting along with the date and time when it was written. There is no macOS app – the desktop app for previous iterations of the pen won’t work with this new one. The iOS app is now called Livescribe+. They do mention that an Android app is available on both Google Play and Amazon App Store. Moreover syncing options are rather limited. The app can auto-send a copy of your notebook to Evernote or OneNote but not much else – unless if you count exporting pages one by one. You can export each page (manually) as searchable PDF, SVG image, or plain text. Therefore you really need to be careful not to accidentally delete the app since there won’t be a way to get the data back aside from restoring your entire iPhone backup. There is also very little facility to organize your notebooks. The app provides three categories to organize each text snippet: Tagged, Favorites and Flagged. You can’t organize individual pages into subjects (unlike the old Livescribe desktop app of yore), nor can you create custom categories of text snippets. However you can rename each notebook to your liking — but that’s just about it. A Feed view shows your text snippets in a timeline-style interface. Similar to Twitter timeline but the oldest text goes on top. A Pencast view which I haven’t have the chance to use. When you search for text, you’ll get the results shown as handwriting snippets in a Feed view. To get to the whole page, select a snippet and then tap the Page tab in the navigation bar of the search result. Un-intuitive but works. The app also has hiccups in reconnecting to the pen. As of version 2.0.0 (274), I often need to force-quit the application and restart it to get it to connect to the pen and sync my data. That is, after the first sync of the day and if the pen gets disconnected (i.e. powered off) or the Livescribe+ app goes to the background then merely activating the pen and app won’t get the two to connect. I need to double-press the home button and swipe up on the Livescribe+ app to force it to quit. Only then the subsequent relaunch can connect to the pen. The original hand-writing scanned in 300dpi and then downscaled for web viewing. The pen’s digital output – the image version of the handwriting. The pen’s handwriting recognition result. The following is the sample text, carefully crafted to show the most common cases of handwritten text. The quick brown fox jumps over the lazy dog. Pack my box with five dozen liquor jugs. Bright vixens jump; dozy fowl quack. The above image is my sample handwriting using Livescribe 3 and then scanned using a flatbed scanner. If you look carefully, you’ll notice that the underlying paper has dotted blue patterns – this is the “special paper” that I’ve been talking about. In this case, the special paper was self-printed from PDF files given by Livescribe using a 600dpi color laser printer. Whereas the image above is the handwriting as captured by the pen itself. Livescribe 3 generates vector images in PDF format, but I’ve rasterized it with a resolution that’s suitable for viewing from the web. I’d say that Livescribe captures my handwriting pretty accurately. The quick brown too jumps over the lazy dog. Pack my boy with file dozen liquor jugs. Bright vixens jump; dozy + owl quack. Finally the text in monospace above is the result of Livescribe’s handwriting recognition. There as no editing done – all miss-spellings are as what Livescribe’s software. As you can see for yourself, the handwriting recognition is pretty good, considering my handwriting isn’t that great to begin with. The above image shows sample handwritten text using Equil Smartpen 2. As it doesn’t require any special paper, I used a standard 70 grams A4 lined notepad paper to write. Whereas the above image shows the digitized picture that came from the pen’s memory. Equil’s software only generates bitmap images, and thus I only cropped and resized it a bit for web viewing. I have to say that Equil’s pen distorts the strokes slightly and seems to make my handwriting worse. Brrghe vixens jump; dozy fowl qvaok. Lastly, the above text shows the handwriting recognition result from Equil’s software. I’ve configured it to use the “English” recognition module. As you can see for yourself, the accuracy is worse than Livescribe’s handwriting recognition. I’m not sure whether this is due to the handwriting recognition module itself or a function of the pen’s slightly worse transcription accuracy. Both pens have excellent hardware design with respect to their target audiences. 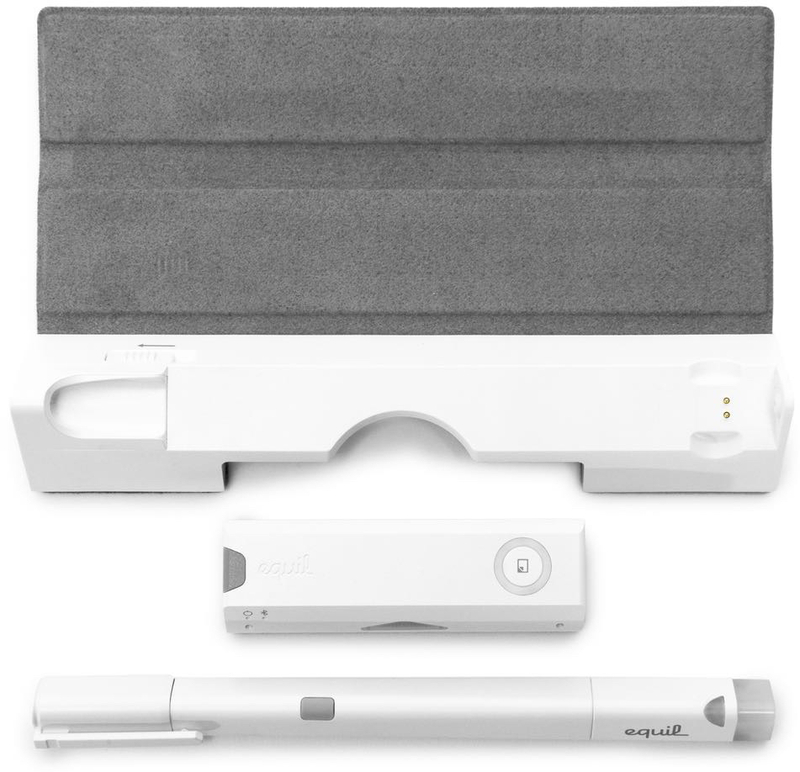 Equil has the hip look whereas Livescribe is as classy as smartpens can be. Each have a solid feel and would probably last you a few years of use – taking into account that they both uses internal batteries. However both their software offerings have much to desire. Alas, poor software design seems typical in hardware companies — a problem shared by many hardware companies save for Apple. What’s worse is that their iOS apps has the Android look and feel and stashes everything under a hamburger menu. That pretty much reflects that both companies doesn’t give much thought in their software design. But yeah, smartpens are in a very niche market. They fill the narrow gaps between pen-and-paper traditionalists, iPad Pro early adopters, and indifferent information workers who takes their laptop to take notes during meetings.